superior stability of the glenohumeral joint. 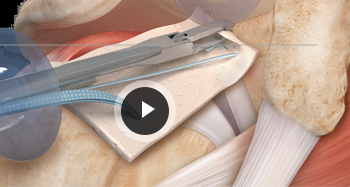 Dr. Peterson offers this exciting new minimally invasive surgical procedure for patients with massive irreparable rotator cuff tears. Dr. Peterson specializes in arthroscopic shoulder surgery and has the most experience performing this specialized procedure in the region. Dr. Peterson says “I am very excited to offer this innovative new procedure to my patients. This surgery can help those whom are not candidates for a traditional arthroscopic rotator cuff repair due to the chronic and massive nature of their tears. Prior to now, the only surgical option involved a full shoulder replacement. This minimally invasive, outpatient procedure has given my patients extraordinary pain relief in just days or weeks and can restore function overhead.